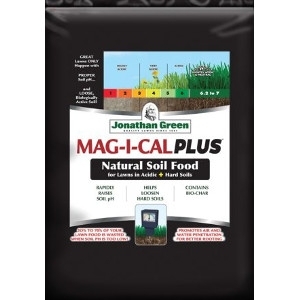 MAG-I-CAL PLUS® for Lawns in Acidic + Hard Soil is a unique, multi-faceted, soil-enhancing food that rapidly raises soil pH, loosens hard soil, and stimulates soil microbes. MAG-I-CAL PLUS® for Lawns in Acidic + Hard Soil contains fast-acting calcium which raises soil pH to enhance nutrient availability from lawn foods and improve cell wall structure. It also fortified with a patented, quick-releasing gypsum to help break up clay and compacted soil for better air, water, and root penetration into the soil. Additionally, MAG-I-CAL PLUS® promotes growth by increasing biological activity to aid in the release of trapped nutrients in the soil.